REA (Resources, Events, Agents) is a business process modeling ontology, closer to the business reality than any other known alternative. Unlike all other approaches, the REA model reveals why business processes occur, and provides for full traceability of all business transactions. Due to its abstraction level covering the business domain, the REA ontology is very useful in model-driven design of software applications. 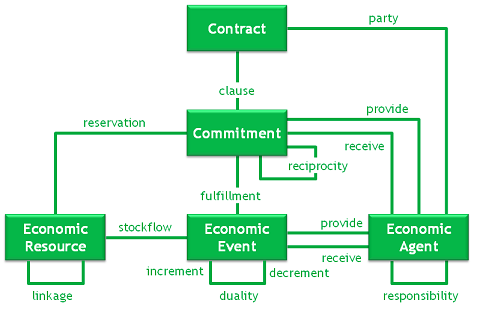 Figure below illustrates the most fundamental REA concepts, which are economic resource, economic agent, economic event, commitment, and contract. Explanation of these concepts and additional information is in the free chapter What is REA from the book Model-Driven Design Using Business Patterns. Mailing list REA Technology is designated to those who would like to understand REA ontology better, how to apply REA in business software, how to create REA models in various application areas. Web site by William E. McCarthy contains most of the seminal and continuing research papers associated with the development of the REA model. REA wiki REA Version 2 provides a platform for a new version of the REA-ontology (REAv2), which aims at supporting model-driven systems engineering, knowledge representation and systems interoperability. Modeling and Designing Accounting Systems: Using Access to Build a Database by C. Janie Chang and Laura R. Ingraham, Wiley 2007, contains practical example in Microsoft Access. A book for students of accounting. Model-Driven Design Using Business Patterns Pavel Hruby, Jesper Kiehn and Christian Vibe Scheller, Springer 2006. A book for software engineers. by Cheryl Dunn, J. Owen Cherrington and Anita Sawyer Hollander, McGraw-Hill/Irwin, 2004. A book for students of accounting. by Anita Sawyer Hollander, Eric Denna, J. Owen Cherrington, McGraw-Hill/Irwin 1999, describes the REAL concept (Resources, Events Agents and Locations). A book for students of accounting. Intuit QuickBooks functionality matched	by an application developed as a domain-specific language test, in 2 man-days using 380 lines of code. Google Apps Integration enables an option of storing business documents in the cloud. New version of Stock Flow Graph covering all resources including cash flow. Classroom Cashbox, a micro-vertical for classroom budgeting and accounting, featuring a new report generator. Budgets and Estimates are now part of the modeling and runtime environment. Posting 10.000 invoices in less than a second using in-memory database. Workflows are now part of modeling and runtime environment. Probably the first model-driven REA application was demonstrated at REA-25, Delaware, DE, USA, on June 13-15, 2007.